You can learn new things and become smart in your job – (1) by doing a professional course and undergoing training, or (2) by reading subject books and applying the learning in work or (3) by working on the job under expert guidance. Out of these, you have full freedom to learn when you choose to read books. 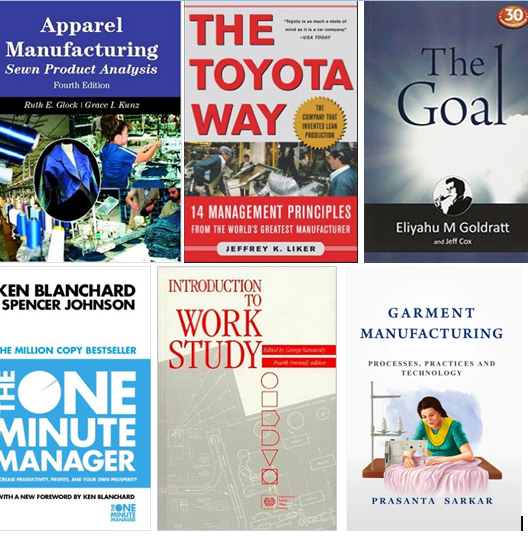 In this post, I will share must-read books those will help you in improving your knowledge while working as an Industrial Engineer (work study officer) in the ready-made garment industry. The listed books are generic and may not be specific to the garment industry or industrial engineering. Theories you learn from reading these books can be applied in the garment industry. Like process improvement, method improvement, managing team and work, doing better planning etc. Anyone can read these books and enhance their knowledge and apply the knowledge in garment manufacturing. Here is the list for your reading and honing your skill. This book was first published in 1957. This book describes the basic techniques of work-study as practised in many parts of the world, has been widely recognized as the best available introduction to the subject for work study practitioners, teachers and students. It covers method study and work measurement procedures and covers not only machine shops but also process industries, the services sector and office work. Buy this book from Amazon store. You know time study and understanding motion economy is must for a good industrial engineer. In apparel manufacturing course these topics are covered superficially. But you must have in-depth knowledge on the following topics those are covered in this book. Buy this book from Amazon store. This book covers the fundamentals of Lean manufacturing. This book explains lean as thinking rather than tools. Buy this book from Amazon store. This is a must-read book as you also need to learn about garment manufacturing processes and technology, with the industrial engineering concepts. I read this book in my college days and have one copy in my library. I learned a lot about garment manufacturing technology reading this book. Buy this book from Amazon store. I have written this book. A guide for beginners those want to enter into garment business. Also, this book is very useful, easy to understand guide for apparel production and fashion students, and IEs those need to learn about the garment manufacturing process. If you planning for starting apparel manufacturing business, I would suggest you have this book in your book list. Know more about this book. 7. One Minute Manager by Kenneth Blanchard PhD and Spencer Johnson M.D. This book is an old one and written in the 80’s. But it's one of the best books ever written on how to manage people and performance. By reading this small book, you will learn how to manage your subordinates (team). Why this is important to take time explaining the work first and instead of just telling your people what to do? The information in the book can be practically used by all managers. Buy this book from Amazon store. In case I missed any book that is equally important to read for a garment industry professionals (specifically IE), please mention it in the following comment box. Books for your reading to improve knowledge on industrial engineering.